Marilyn Monroe’s FBI files are now available! 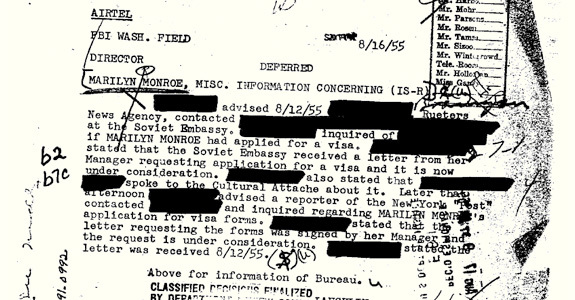 The files (available in two parts) insinuate a communist connection between Marilyn Monroe, which was the center of attention in the files. Her close relationships with government officials like her ongoing affair with President John F. Kennedy and his brother Bobby Kennedy put her in a very pivotal position. Only months before she died she was in Mexico rubbing with shoulders with the likes of Frederick Vanderbilt Field, the black sheep of the Vanderbilt family who was a communist probably before he could walk. Though the transcripts of the files are out, there really isn’t any new news concerning Ms. Monroe. It’s already been known for years the FBI was following her every move, especially towards the end of her tragic life (cut short at age 36 back on August 5th, 1962) because of contrasting ties with both the White House and blacklisted actors and directors. Warhol's Mao is unacceptable in China!